We got up early at 6am because we bought a combo pass for the temple entry and watching the monks pray at 6:30. What a difference the temple area was compared to during yesterday's festivities. There was no one in sight along the streets or around the temple. 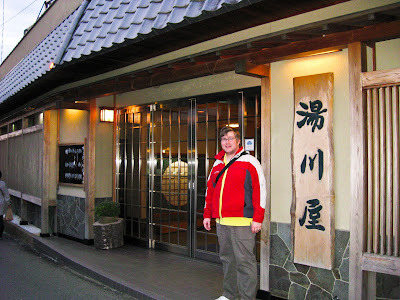 We headed back to the ryokan for breakfast. This was outside of room in a sitting room downstairs. The breakfast was also fancy, but slightly less food than the feast the previous night. Very yummy! 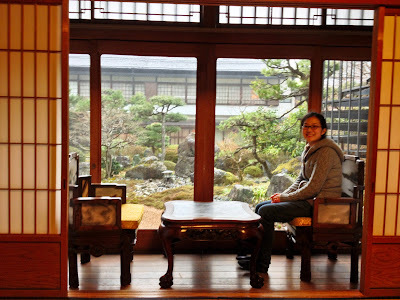 The ryokan stay was amazing. 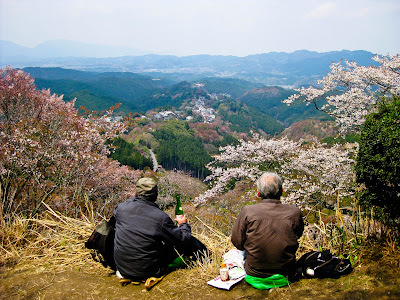 We didn't have too much time, so we took a bus to the top area of Yoshino and then hiked around to see the blossoms up there. What a pretty place. 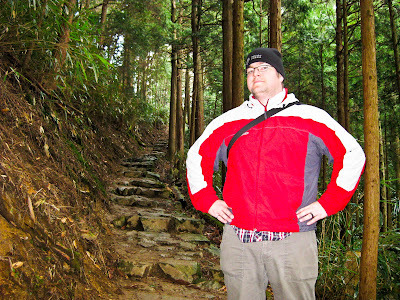 As we headed on the path down the mountain there were lots of viewpoints, shrines and other historical landmarks along with tons of people having picnics under the trees. Yoshino was pretty awesomesauce. It was pretty cold when we were in the top area of the mountain. I sure wished we had packed a thermos of hot tea like a lot of the others up there! 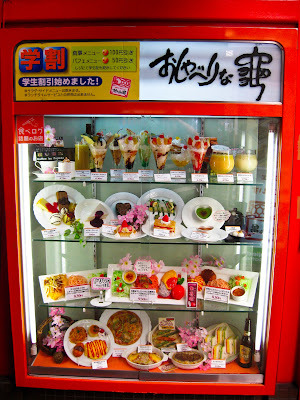 However, as soon as we descended to the next level, there was a vending machine which had hot green tea. Amazing! I could not believe it. We also had some hot mochi blobs on sticks lower down and bamboo tempura on sticks. Yum. 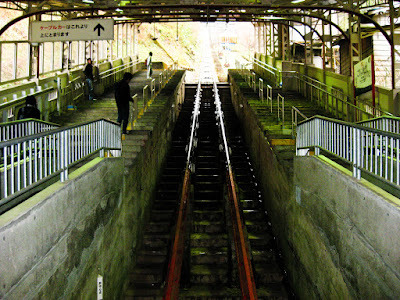 Next, we took the train to Koyasan. 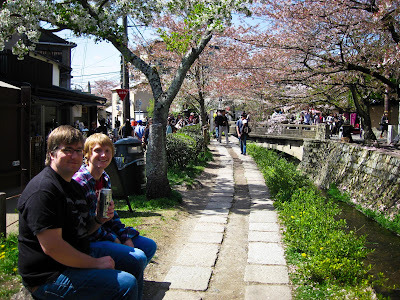 The train to Mount Koya was a sweet ride through countryside towns and mountain tunnels. Chris was lovin' it! At the end of the line, we took the cable car up to the small mountain town. 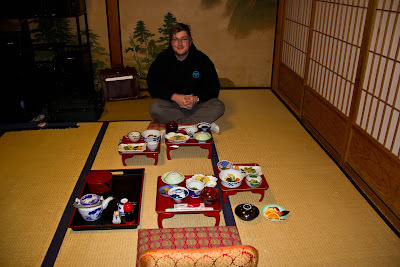 We booked a room at one of the many temple lodging places in Koyasan. Our room was awesome with a separate entry area and an enclosed outer area which overlooked one of the many pretty Japanese gardens. Man, was it cold though! Much colder than Yoshino! 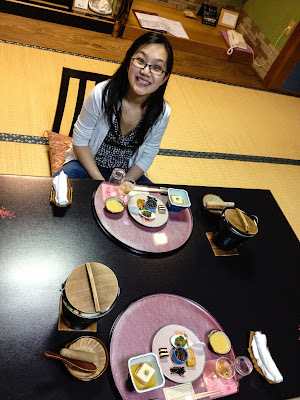 By the time we arrived it was almost dinner so we had a similar Japanese meal in our rooms as in Yoshino. This one wasn't as fancy and vegetarian, but still yummy. They also brought in all the food ahead of time on little trays and then left so it was a bit more relaxing. 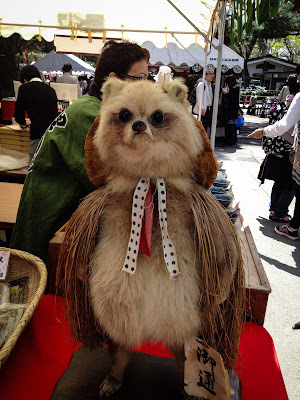 Chris and I woke up in Nara and took a 9am train for Yoshino. At the base of Yoshino, we waited in line for the "ropeway" (gondola) up to the lower level of the mountain. You can walk up, but it was gravelly and we had all our luggage so we waited in the loooong line. 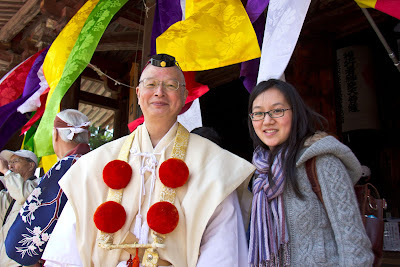 In front of us was a lovely Japanese older couple from Kyoto. While they didn't speak English and we didn't speak Japanese, the husband had worked in Paris and so we conversed a bit in French. We finally got on the ropeway and went up to the lower level. Yoshinoyama is divided into four levels. 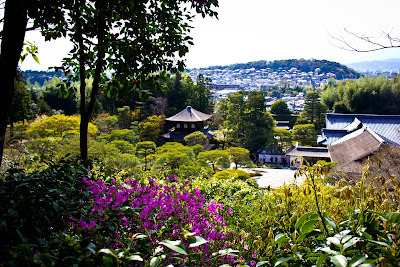 There is a steep winding path that goes up the mountain lined all sorts of food stalls, souvenir shops, restaurants, tea houses and ryokan hotels. Luckily the ryokan we booked was only an 8 minute walk from the gondola. And the people, so many people! What a bustling mountain road! 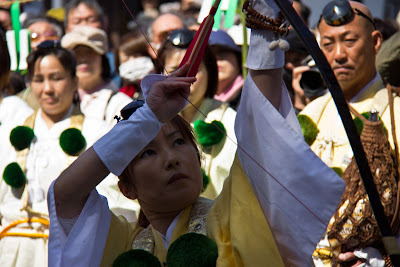 A traditional event since Heian era. Mochi rice, donated from all over Japan, are pounded with many pestles. Hense it is called Thousand Pestle Pouding. 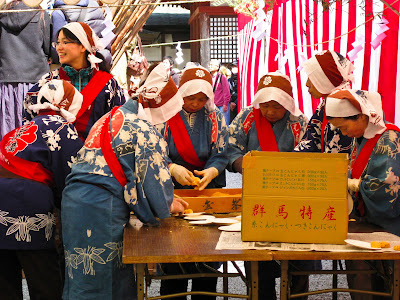 The product, rice cakes are distributed to visitors afters after being placed in front of Zaou Gongen at Zaoudou. A unique lighting ceremony by femal dicipliants also available. 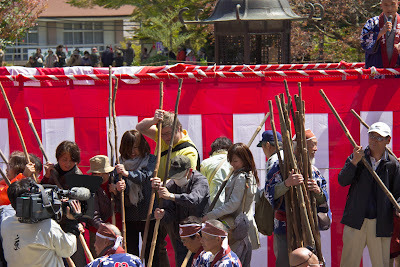 Up on stage, the monks began singing and people would go up and take big sticks and grind rice in big buckets. 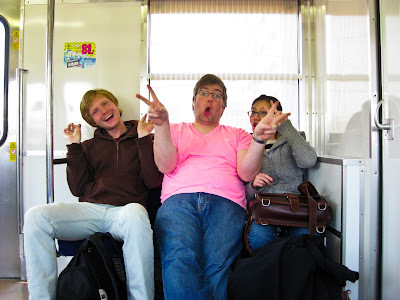 We could only see Japanese people around, but Chris decided to go and see if they would let him participate too. 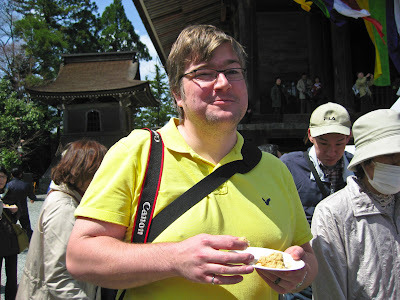 A head taller than everyone and wearing a bright yellow shirt, he went up on stage to partake in the rice pounding. In the end it turned into a fine powder and ladies at the side of the stage used it to make these delicious mochi rice cake things. We read that the monks used to throw them out to the crowd, but now they just hand it out on plates. We lined up and man were they nice and warm and delish! We almost lined up for seconds. Ok, we actually lined up for seconds but they ran out before we got some. 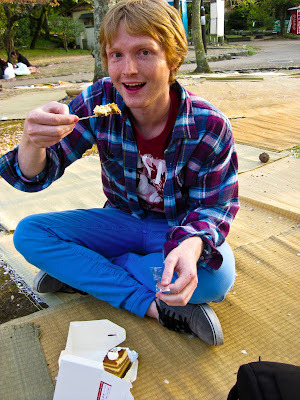 Chris is enjoying the fruits of his labour, after pounding rice on stage! 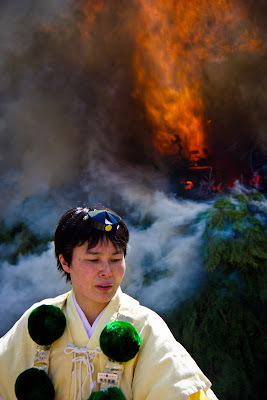 Afterwards there was another ceremony put on by the women which involved a bow and arrow and lighting a big pile of ferns on fire and then pouring water on the pile so it smoked and smoked and smoked! They played on these conch shell things. Music to Chris's ears! We headed farther up the mountain and picked up some cherry blossom rice snacks and sushi to go. 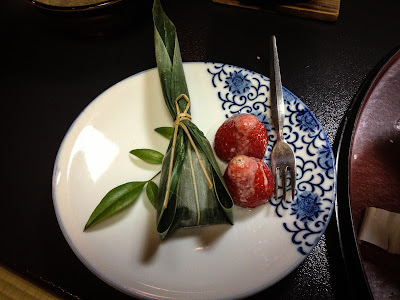 The sushi was individually wrapped in little leaves and came in a small wooden box. So nicely presented! We headed back to check into the ryokan. Our room was really spacious (compared to the other tiny hotel rooms we previously had). It overlooked the side of the mountain. We were welcomed with hot tea and a treat at our little table in the middle of the room. 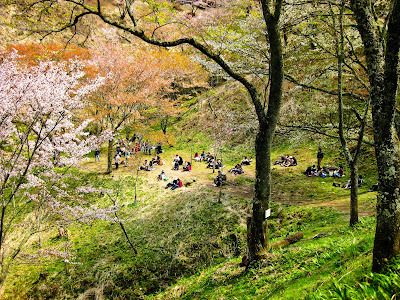 We wanted to head to the top part of the mountain where the best cherry blossoms would be. The season started early so the lower levels were already past their peak. But it's quite a hike, taking about 1.5 hours so we decided to just see how far we could get before dinner. 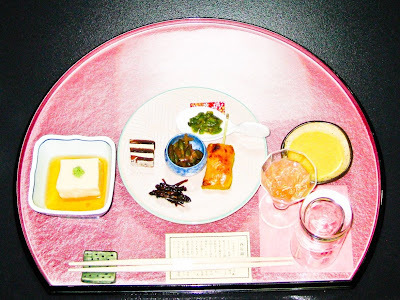 When we arrived, the first dishes were already set up on the table in our room. Lots of beautiful little dishes with a bite of food on it. We were unsure of what anything was or how to start. 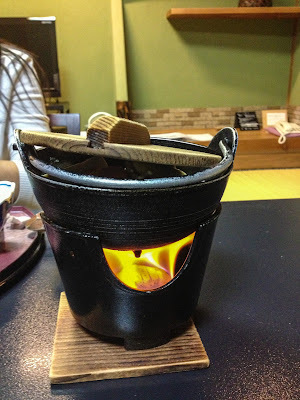 There was also a japanese hot pot bucket which the hostess lit as we sat down. Then she just kept bringing out more and more dishes. It was crazy and each dish was so pretty! The kaiseki feast finally ended with some rice and miso and an amazing desert of mochi with ice cream inside and strawberries. One of the nicest meals I have ever had. Wow! The start of our Kaiseki Feast. By the end, the table was overflowing with all of the different dishes! Delicious bubbling pot with chicken and veggies cooking inside! Bunch of clear unknown raw things on ice + more! Mmm.. the dessert was so good! After dinner they cleared our dinner plates and set up the futonlike beds on the floor where the table was. This answered my question to Chris from earlier when we first arrived in the room: "...so where do we sleep?" We went down to the bath area for a nice soak after googling what the procedure was! I think we had the best sleep yet on the floor of the ryokan room, after a big day of lots of walking and hiking and the futon pads were much softer than typical hotel beds. We woke up at our hotel in Kyoto and got some breakfast down the road at Inoda Coffee. The coffee was really good! 2 for 2 Kyoto! 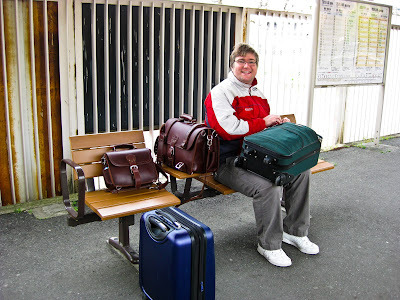 Then caught the train to Nara. 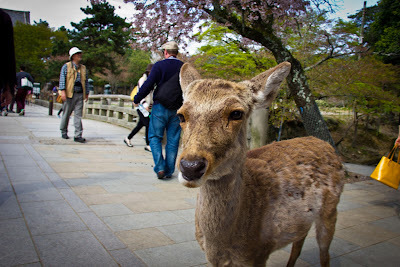 In Nara we checked into our hotel then headed to the main attractions nearby. On the way, we stopped for some lunch. I love how all the restaurants have plastic versions of their menu items outside so you can easily see what they have to offer. The food models are so detailed and make you hungry too. Seems like deserts and desert plates are a big thing here. You will often see a whole plate of desserts for a set price. So amazing. I am going to skip dinner and just have a plate of desserts sometime this trip. 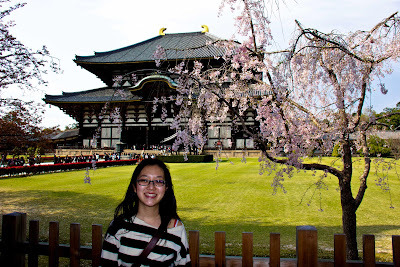 We made it to the main tourist area where there was a large park and the massive Todaiji temple. Firstly, there were deer EVERYWHERE. Lots of stands selling deer crackers and lots of bold deer who would follow you around if they could smell the food on you. 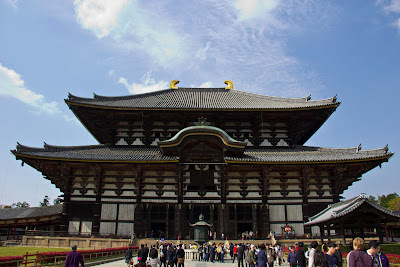 The Todaiji temple was HUGE and housed a really really big buddha. 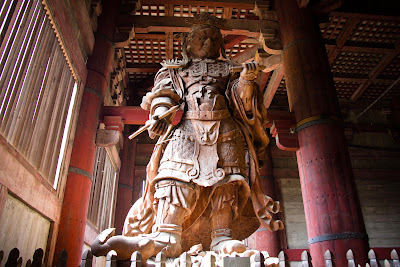 Past Todaiji there were some more cool old temple structures and we just chilled out in the sun and quiet. We wanted to check out Horiuji (?) where the oldest wooden structures were, but the cab driver told us it would be impossible to make it there. So we headed back to the hotel and stopped for smoothies first. Then we went to a tapas izakaya place where you ordered with a scanner pen and everything was 294¥. 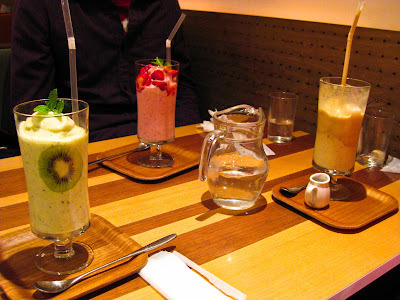 We tried lots of yummy things and had some drinks. Before Gordo had to take the train to Osaka for the night we went to a building that just said Amusement on the outside. They had lots if blinky lights on the inside which turned out to be little arcade grabby games and photobooths. We headed into one of the photobooks to get some pics. We tried to follow the poses as best we could. Not only did it take photos, but also airbrushed and photoshopped your skin and face and especially eyes! Then you could go to the next station and add all sorts of stamps and text and draw. Amusement! After landing yesterday at Narita, we trained in the evening to Kyoto. Good morning Kyoto! We had some sweet make your own coffee in the room with a cool coffee packet that looks like a tea bag. But then you tear off the top and fold out paper arms that hook onto the rim of the cup and pour hot water through the makeshift filter. Magic! 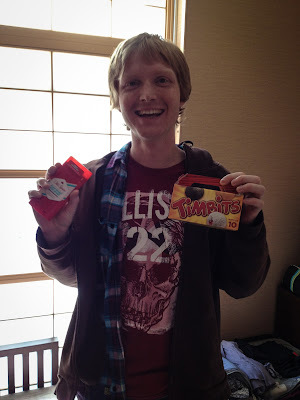 Gordo arrived around 10 and we gave him the things we brought for him: deodorant and timbits! We set off into town. We visited the Imperial Palace in Kyoto first. Today is the last day of the open house where you can go in freely without booking a tour. 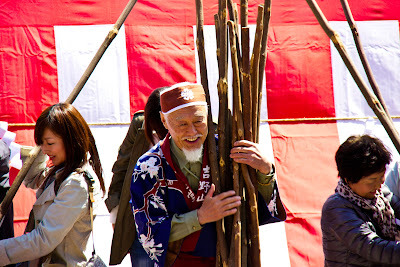 It was pretty crowded and filled with older Japanese folk! It's a Monday I guess. We walked around some more, looking for lunch. We found a tiny restaurant with only 5 tables. One just opened up so we sat down. There was no English to be seen, luckily we had a Gordo who translated the menu for us and ordered. We got various eggy things on rice. Mine had yummy mushrooms. 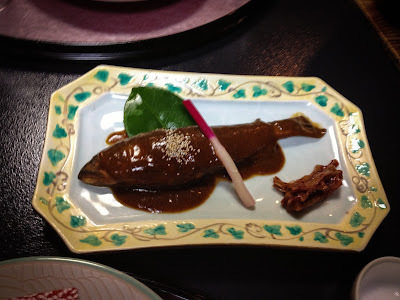 For 750¥ it was pretty big and yummysauce! We took a bus to Philosophers Walk. 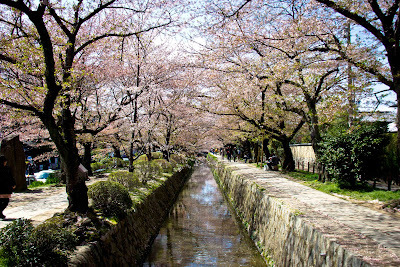 We traipsed along a nice path lined with cherry blossoms. It was a beautiful sunny day and Chris took lots of pictures even though the blossoms had started to fall and leaves show. I had green tea ice cream and the guys got beer on the side of path. 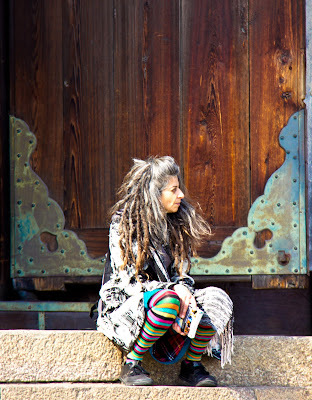 We took a seat along Philosophers Walk and enjoyed our treats in the sun. Just lovely. What could help soothe jet lag better than beer and ice cream? At the end of the walk there was Ginkakuji temple ahead, so we walked through empty winding residential streets at the very north of the city to the temple where it joined the main road. We toured the temple with sweet Japanese gardens and rock/sand structures. 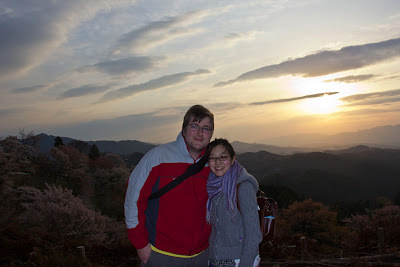 It was a pretty big place with lots of things to see and at the top, a great view of Kyoto. We headed back down the main path from the temple down the hill which was lined with all sorts of food stands and shops back to the bus area. 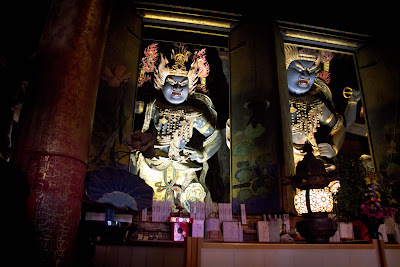 We were going to catch the bus to Arashyama which is a quaint fishing town area in the western part of Kyoto, but decided it was too late to go so we got off the bus at Higashiyama. 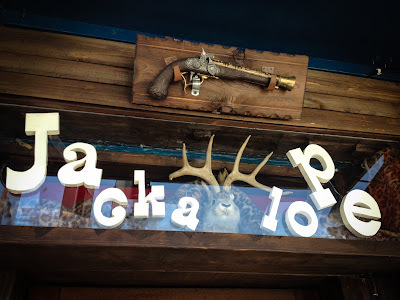 We spotted a cafe and had a break sipping some really good espresso at Pooh's Cafe. They had some delicious looking desserts, but we were too full. We did stop at a bakery though and Gordo bought a fancy cake slice. 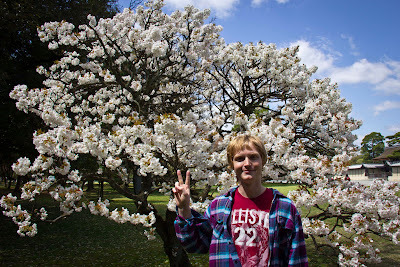 We walked through Mauryama Park, which is a big hanami (cherry blossom viewing) spot. 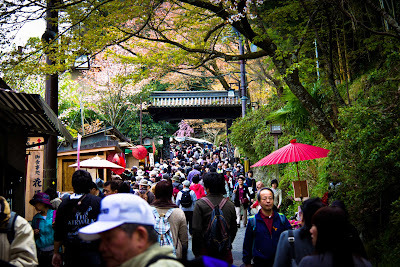 Buncha temples, food stands and people sitting on mats and having picnics. We sat down under some trees and Gordo ate his cake. 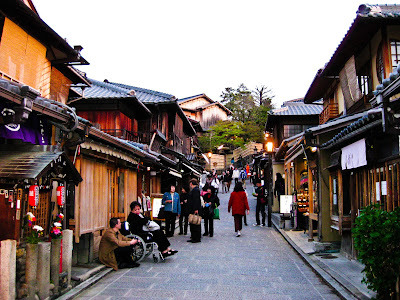 We continued through the park to the old town streets of Higashiyama. Amazing old town streets converted to shops and restaurants. In the middle was a cool five story pagoda and Kodaiji temple which they light up at night in the spring. We found a cool metalworky watch shop and I got a sweet wind up watch! then we found a restaurant on the hill called "omen" with delicious homemade dipping noodles and tempura. 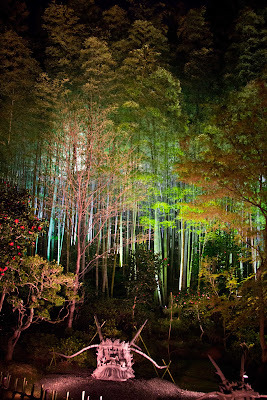 We headed back to Kodaiji temple to tour the grounds which were all lit up. Very purdy. Our feet were pretty tired after the long day of walking so we cabbed back to the hotel. An early night since Chris and I were jet lagged and Gordo had taken a night bus to Kyoto the previous night. We did stop at a snack store on the way home to pick up some treats though. Green tea kit kats wut!! !